HOUSTON (AP) Clayton Kershaw returned to the dugout and sat down after one of the worst performances of his major league career. 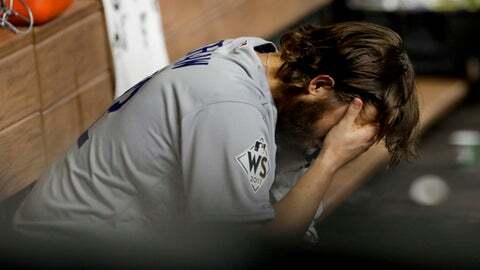 A few minutes later, the Los Angeles Dodgers’ lead gone, he buried his head in his hands. In the opener, he conjured memories of Sandy Koufax, Don Drysdale and Orel Hershiser. In Game 5, he had an outing to forget. Expected to dominate the Houston Astros and move the Dodgers within a win of their first World Series title since 1988, Kershaw wasted a four-run lead and was chased in the fifth inning of a crushing 13-12, 10-inning loss on Sunday night. Los Angeles headed home in a 3-2 World Series deficit. A three-time NL Cy Young Award winner and five-time NL ERA champion, Kershaw is likely a first-ballot Hall of Famer. The 29-year-old left-hander hoped this October would be the crowning achievement of his career, a ring to fill the emotional hole left by a string of October exits. Los Angeles provided Kershaw a 4-0 lead. He had faced the minimum nine batters through three innings, allowing only a single. The Dodgers had been 19-0 this year when scoring at least four runs in a game started by Kershaw, and this seemed a likely No. 20. But Kershaw walked George Springer leading off the bottom of the fourth, Jose Altuve singled of a slider with one out and Carlos Correa hit an RBI double off a fastball. Yuli Gurriel’s no-doubt, three-run homer to left , a crushed first-pitch slider, jolted most of the orange-clad crowd of 43,300 outs of the seats. A shocked Kershaw whipped around to watch the ball fly. Cody Bellinger seemed to rescue the Dodgers, hitting a three-run homer in the fifth against Collin McHugh for a 7-4 lead. Reprieve led only to another reversal. Kershaw walked Springer with two outs in the bottom half, shouting at himself after missing low with a slider on a 1-0 pitch. Ahead of Alex Bregman 1-2 in the count, Kershaw walked him on the 10th pitch. That was enough for Roberts, who pulled him after 94 pitches, just 57 of them for strikes. Jose Altuve sent Kenta Maeda’s seventh pitch over the Phillips 66 Home Run Porch in left-center , tying it 7-7. Kershaw allowed 27 home runs during the regular season, seven more than his previous career high. Gurriel’s was the eighth off Kershaw in the postseason, the most ever allowed by a pitcher. Kershaw induced just four swings and misses, his fewest in a start since four by San Diego on April 5, 2012. As the bats where wheeled out of the clubhouse for the charter flight back to Los Angeles, Yasiel Puig said there was no doubt the Dodgers will win Game 6. ”This is not going to be finished Tuesday. It’s going to be Game 7,” said Puig, whose two-run homer sparked a three-run comeback in the ninth that sent the game to extra innings. Bellinger, who drove in four runs, also looked ahead. But first, a day of rest.